Wayne shares his interest in the war history whilst walking the track. If trekkers are interested in the culture he shares with them his village experience and enjoys stories shared by other trekkers about their family and life back home. Wayne is fluent in English has good leadership skills and knows the track extremely well. Several times he has ran it at night during the Kokoda Challenge Races he has entered. 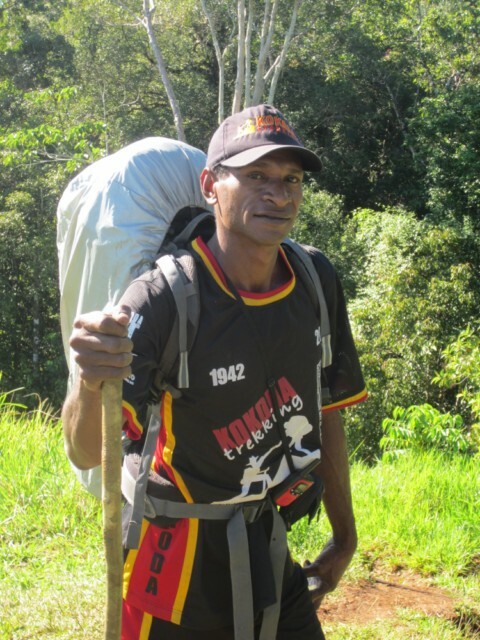 Wayne has been a regular competitor in our ‘Kokoda Challenge Race’ coming second on a couple of occasions to the record holder Brendan Buka. Wayne is super fit and it has been said, he can walk at the speed most people run. However, on his treks he paces everyone well and always tries his best to give them a great experience and a trek they will enjoy and remember for the rest of their lives. On 31 August 2008, Bendan Buka again rewrote the record books by winning the 2008 race in a new record time of 16:34:05. Wayne Urina, 2nd fastest man to complete the crossing of the Kokoda Trail with a time of 18:34 from Owers’ Corner to Kokoda. Wayne has competed in the Gold Coast Kokoda Challenge Race as part of our ‘Elite’ team of four and finished 3rd overall. Has visited Australia on several occasions at the invitation of trekkers.